A patient can incur a brain injury in several different ways. Acquired Brain Injury (ABI)—that is, brain injury that is not genetic, or present at birth—can have many triggers. It might be the result of a stroke or oxygen deprivation (hypoxia). It can be caused by drug or alcohol overuse. Heavy metal toxicity such as carbon monoxide poisoning can also cause brain injury, as can infections, surgery, and brain tumors. Traumatic Brain Injury (TBI) is generally caused by some sort of head trauma, in which an external force injures the brain. The effects of a brain injury can be varied as the causes. However, patients who suffer this sort of injury do tend toward similar mental, emotional, and physical symptoms. Immediately following a brain injury, patients often suffer headaches, emotional disturbances, dizziness, and tiredness. Sometimes, these symptoms persist. A brain injury can cause the patient to forget words or their meanings (aphasia), or general memory impairment (amnesia). The patient might take longer than they used to process information and their speech may be confused or halting. They may become fixated on a certain activity or idea. Patients with a brain injury might develop poor judgment and have difficulty complying with social norms. Your loved one, who was once the soul of tact, may suddenly make rude and inappropriate comments, speaking or acting impulsively. Their infinite patience might have been replaced with a volatile temper. Feeling fragile as a result of their brain injury, they may become anxious and be prone to sudden crying jags or other emotional outbursts. Some patients have difficulty with motor control and movement (apraxia). Their speech may be slurred, and they might even experience vision problems. Their sense of balance and stability may be adversely affected by the brain injury. Their energy, once seemingly boundless, may be sapped. Insomnia and other sleeping problems may manifest themselves, making energy levels plummet. Someone with a brain injury could potentially become malnourished. Their sense of smell or taste might be affected by the injury, making it harder to find food appealing. Their hunger drive can be altered by their brain injury, and memory problems could make it difficult for them to keep track of when, what, or how much they’ve eaten. 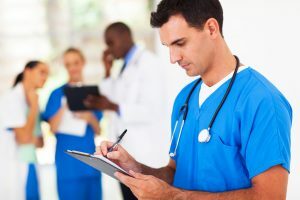 Assured & Associates, a group of highly trained medical professionals serving northwest Georgia, has the knowledge and expertise to provide excellent daily care for patients with a brain injury. The Registered Nurses (RNs), Licensed Practical Nurses (LPNs), and Certified Nursing Assistants (CNAs) at Assured & Associates understand the nuanced difficulties that your loved one may be experiencing. Our medical staff can perform regular neurological monitoring to assess the patient’s condition on a day-to-day basis. We’ll be there for all of the patient’s needs, whether physical, nutritional, or emotional. We’ll help with physical tasks like dressing, getting around, and carrying needed items. We’ll make sure that your loved one regularly eats a varied and nutritious diet, keeping track of food volume and nutrient intake. We’ll keep meticulous records of the medication we administer and note which physical therapy exercises have been performed each day. Thanks to our years of experience, Assured & Associates’ attentive staff has the patience to communicate with those suffering from information processing difficulties. We understand that your loved one, through no fault of their own, may be prone to violent outbursts, and we are trained to deal with this difficult and delicate situation. Assured & Associates gives you and your loved one the support you need to deal with a life forever changed by a brain injury.